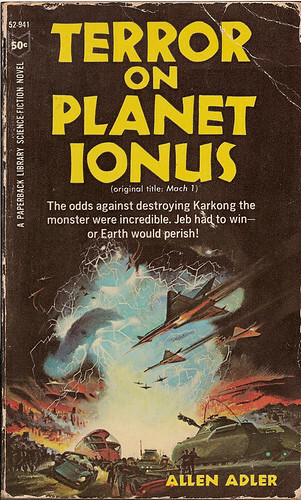 In the spirit of The Atlantic Abomination, the John Brunner giant monster book that I’ll likely finish tomorrow, the above book involves a giant monster as well. It’s Terror on Planet Ionus, the 1966 paperback edition of the sole novel (so far as I know) of Hollywood writer Allen Adler. The original 1957 hardcover edition (from Farrar Straus and Cudahy no less!) was called Mach 1: A Story of Planet Ionus. Adler himself is an interesting character. He wrote the story for the screenplay for the movie Forbidden Planet and then got on the Hollywood blacklist during the Second Red Scare. The cover alone makes this book look like a hell of a lot of fun, and it’s very near the top of the read list on the strength of the cover blurb alone.